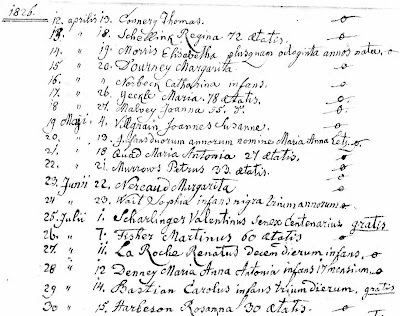 Harbison genealogy: Rosanna Harbeson 1796-1826...Philadelphia? I've been slowly working through the plethora of Philadelphia street directories, trying to make coherent sense of the family of Sampson Harbison. And I was making headway. There are two John Harbisons in what was Kensington Ward 3 in 1850 and became Philadelphia Ward 17 in 1860, near St. Michael's Church, which was a nucleus for Catholic Harbisons. Both were listed as weavers. This means little; virtually every poor person who came from Northern Ireland was a weaver. Ulstermen subsistence-farmed for food, and wove flax into linen for cash. One John lived on Cadwaller above Master; the other on Hancock below Master, a few blocks away. I found a death certificate for the Cadwaller John's wife, Rosanna, which gave her street address; and a marriage record for their son James, in a Presbyterian church. This confirmed what I already believed; Sampson's son John lived on Hancock. Unwilling to leave well enough alone, though, I casually looked at the other Rosannas. And there I found a Rosanna Harbeson, buried at Holy Trinity Catholic Church on July 15, 1826, aged 30. The spelling is probably insignificant; the name was always spelled Harbeson in Philadelphia before 1850. But I have no idea who this woman was, and I can find no other records of her. There are two Harbesons in the Philadelphia Street Directory for 1825, Hugh and Samuel. 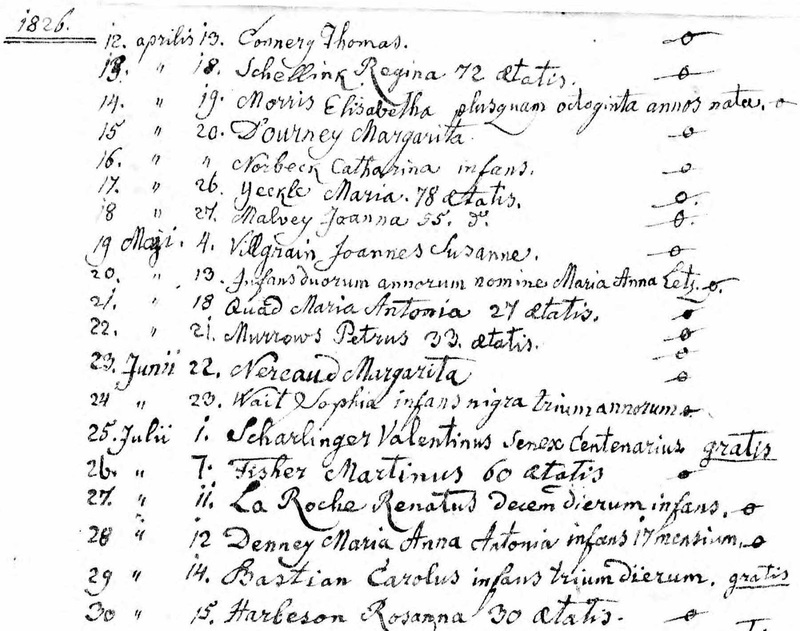 In fact, there were several Harbisons in Philly in the 18th century, most descended from Benjamin Harbison, b. 1725. Benjamin was undoubtedly Protestant (Methodist). I don't even know if Harbeson was a married or a maiden name. But there's a mystery here; there were Catholic Harbisons in Philly almost two decades before I suspected. Were she or her husband descended from the Ballyneill branch, or the Portmore branch? Could she have been sister or sister-in-law to William? One more point; look at the names. Early Catholic Philadelphians were mostly not Irish.